In 2005 the Caucasus’ oldest academic institution – the Institute of History, Archeology and Ethnography of the Dagestan Scientific Centre of RAS – established a scientific journal "Herald of the Institute of History, Archeology and Ethnography of the Caucasus". It became a place for publications of researches on relevant issues about history and archeology of the region. Over the years, the herald (Vestnik) has acquired its current and unique form and the editorial board has determined its profile and position in selecting of articles to publish. In 2018, the journal changed its name to "History, Archeology and Ethnography of the Caucasus". The editorial board was renewed and expanded. Now, the editor-in-chief is a corresponding member of RAS and DAI, Doctor of History, Professor Khizry Amirkhanovich Amirkhanov. The editorial board, the involvement of foreign reviewers, as well as co-operation with the multicultural team of authors, define journal’s International status. 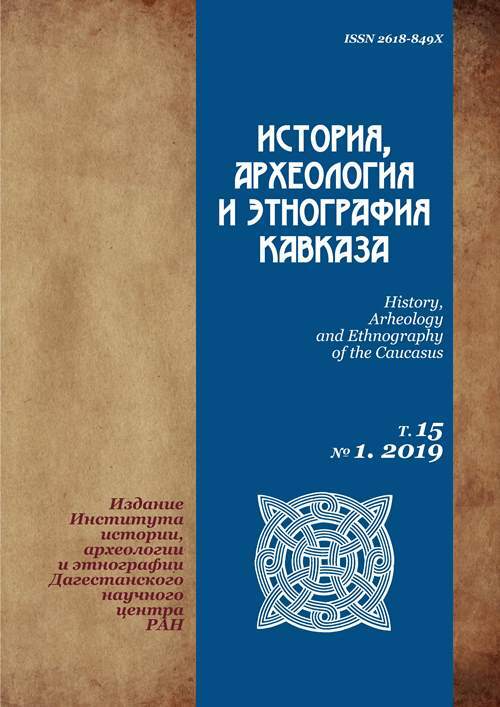 The “History, Archeology and Ethnography of the Caucasus” publishes original theoretical and scientific researches on urgent topics, and articles regarding the personnel (anniversaries of famous scientists; obituaries). Key research guidelines are archeology, ethnography and history of the Caucasus region, as well as researches on historical demography and sociology, numismatics and paleography, oriental and other historical disciplines. Papers at the interface between different disciplines are also welcomed. The chronological coverage is from the ancient times to the present day. The journal considers unauthorized collecting of antiquities as an activity that contravenes the European Charter for the Protection and Management of the Archaeological Heritage, Russian legislation and general academic views on professional ethics. Regarding the above, the journal will only publish works based on results of legal archaeological research or analysis of the material, stored in the State Museum Foundation. The journal is published in both Russian and English with detailed abstracts in both languages. The quality of submitted manuscripts is determined by the double-blind peer-review, and then the Editorial Board decides whether to publish it or not. The journal reserves the right to reject articles, which are out of the journal’s scope, or those violating the journal’s policies and requirements. Authors will be notified about the decision on the compliance with the requirements as soon as possible. The reviewing process may take up to six months. Erlikh V.R., Spasovsky Y.N., Godizov G.L. Gmyrya L.B., Saidov V.A., Magomedov Y.A.